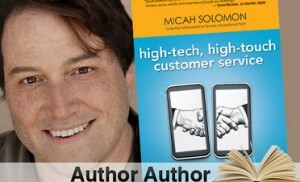 Today I am pleased to present a guest post by Micah Solomon. Customer service consulting can be intensive. Technical. Highly detail-involved. But sometimes, the simplest things tell the most. You don’t need to burn the midnight fluorescents huddled over a spreadsheet to discover some of the issues dragging a company down in its attempts to bond, for life, with its customers. For today’s example, let’s talk about timeliness. Often the first thing I notice when I start analyzing the customer experience for a client company? The discrepancy between the timetable the company thinks is fine and what a typical customer actually expects in the year 2013. The difference is, by and large, staggering. Because customers and their expectations of timeliness have changed a lot faster than the systems and standards of most businesses. Which is a dangerous, dangerous situation for the companies in question. What was plenty fast this time last year feels like molasses now to the very same customers because of changing expectations brought by mobile technology, social media–induced restlessness, the incredible efficiency of vendors like Amazon.com, and other factors. To be blunt, your business will soon be roadkill if you don’t match customers’ expectations of what “timeliness” means. 1. Fill out and submit an inquiry form on your own website. How quickly does someone respond to your web inquiry? 36 hours? That may have been fine in 2004, but a 36-hour response time is something like a hundred and eighty-nine Internet years. You may as well not even bother at that point. 2. Try to find out some simple but important info from your own company without contacting a human being. (The kinds of simple information I’m talking about: hours of operation for holiday weekends, for example, or GPS coordinates for driving, or the file formats that are acceptable for upload, or… –whatever is germane to your business and likely to be searched for by your customers.) Don’t phone, don’t email. Just try to get this info from easily available sources: your site’s FAQ’s, for example. I’ll bet you’ll find the info either isn’t there, or is incomplete. This is bad news. Because a customer’s impression of your company’s timeliness is destroyed when they have to contact you for what I call Stupid Stuff: for example, the questions customers are forced to call you with after they’ve searched for the answers to those same questions on your website or your mobile app—and found them nowhere. Or phone calls they have to make to your reps because your product keeps breaking on them in the exact same way, but word isn’t getting to your engineering team to get the update out that will fix it. These impositions on your customers are all what caused me to coined the term “Stupid Stuff ™’’ (although depending on the squeamishness of the client and the absurdity of the context, ‘‘stuff ’’ might or might not be the actual ‘‘S Word’’ I use). No matter how otherwise-perfect your product or service is, in the eyes of the customer it’s broken if you either deliver the product or service late, or make it hard to find the information that would make the product or service easy to purchase and use. Worse, on-time delivery is the most movable of moving targets. What seemed speedy last year may seem snail-like today. "Give it [your smartphone] a second. Would ya? Could you give it a second. It’s going to space. Can you give it a second? From space. Is this speed of light* too slow for you?" * I know, gentle geeks: “speed of light” is [sic]. Well, good luck, Lucky Louis. I don’t think customers are going to relax their absurdly escalating expectations. So it’s up to the merchants, the vendors, to adapt to these escalations. Companies in today’s marketplace need to come up with solutions that stay in step with customers’ ever more extreme perception of what ‘‘in a timely fashion’’ means. Because if they don’t, their competition will step in to fill the timeliness void. Great post! I have been working in customer experience management for many years and it really is all about how you say things to customers. There is a huge difference between saying "sorry we can do that" and "I know how you feel, tell me exactly what happened". Diffusing the situation seems to be a lost art in today's customer service industry.